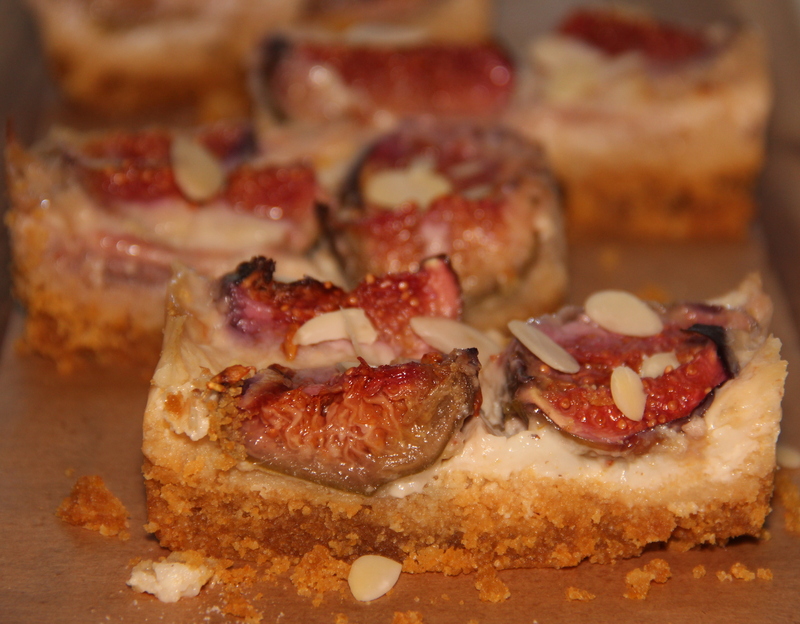 Custard fig tart slices are made with almond meal crust which makes it flour free. A homemade custard is used with orange blossom flavour and topped with fresh figs. Custard is made with non-dairy milk and sunflower spread which makes it vegan. Dissolve arrowroot powder in 1/2cup milk and keep aside. Heat the remaining milk with the maple syrup and mix well. Once the milk come to boil, reduce the flame to low and add the arrowroot milk mixture and cook over a low flame, stirring continuously till the mixture coats the back of the spoon. Finally add orange blossom water/essence mix well and turn off the flame. In a mixing bowl combine almond meal/flour, baking soda. Grease the baking tray/loaf pan and keep aside. Add in vegan spread, vanilla, maple syrup and water and mix well until just combined, using lightly greased hands, press the dough evenly over the bottom of the pan. Refrigerate the crust for 30minutes-1hour or until chilled. Pour custard on the chilled crust and place sliced figs and bake for 20-25minutes. When you remove from the oven the custard would slightly wobbly but once chilled it sets. Sweet can be altered as per the taste. Egg can be used alternatively to arrowroot powder for custard so it makes the custard firm. Orange blossom can be substituted with vanilla essence if not handy. Any milk of your choice can be used in custard. Posted on October 11, 2014, in Dessert, International, Vegan and tagged Chitras healthy kitchen, Dairy free pie, drchdietfood, Gluten Free Pie, Vegan pie recipes. Bookmark the permalink. 40 Comments. Wow, Wow, Wow! This sounds divine!!! Thanks Charu..each feedback of yours is a booster to my work.. I have to eat gluten-free and I have issues with dairy so this amazing looking dessert tics both those boxes! Am very happy this recipe is a Tick in your menu…. Thanx Radhika for your visit and feedback. ..
mmm this looks great, I love figs! Thank you for sharing this at Healthy Vegan Fridays! I have pinned your recipe to our Pinterest Board.